New Orleans In Minneapolis, a white man in his early twenties with some of his gun happy buddies showed up at a Black Lives Matter protest and shot five people. It goes without saying that he was a stone cold racist, but the police also identified him as a member of the sovereign citizens’ movement. The memory dims. What the frick is that movement and where did it come from? Well, first things first, when you start trying to get your arms around the threat they present it’s worth knowing that the FBI thinks there are 100,000 of them in the country, which is not a huge number, but definitely a dangerous subset. Oh, yeah, and the FBI classifies them as domestic terrorists. In fact surfing around it seems that just last year former Attorney General Eric Holder thought this domestic terrorism problem was serious enough that he reestablished a special task force inside the Justice Department to coordinate response to them. We have also seen recently in the shooting at the Colorado Springs Planned Parenthood clinic and in numerous other outrages, a growing surge in this direction, which seems even more serious than the saber waving about outsiders coming into the country when it seems like it’s the insiders who are doing the damage. Sovereign citizens it turns out have a theory that basically you “just say no,” and the federal government becomes meaningless to you. The big whig becomes the local sheriff. the theory … is that there are two classes of citizens in America: the “original citizens of the states” (or “States citizens”) and “U.S. citizens”…. U.S. citizens or “Fourteenth Amendment citizens” have civil rights. Legislated to give the freed black slaves after the Civil War rights comparable to the unalienable constitutional rights of white state citizens. The benefits of U.S. citizenship are received by consent in exchange for freedom. State citizens consequently take steps to revoke and rescind their U.S. citizenship and reassert their de jure common-law state citizen status. This involves removing one’s self from federal jurisdiction and relinquishing any evidence of consent to U.S. citizenship, such as a Social Security number, driver’s license, car registration, use of ZIP codes, marriage license, voter registration, and birth certificate. Also included is refusal to pay state and federal income taxes because citizens not under U.S. jurisdiction are not required to pay them. Only residents (resident aliens) of the states, not its citizens, are income-taxable, state citizens argue. And as a state citizen land owner, one can bring forward the original land patent and file it with the county for absolute or allodial property rights. Such allodial ownership is held “without recognizing any superior to whom any duty is due on account thereof” (Black’s Law Dictionary). Superiors include those who levy property taxes or who hold mortgages or liens against the property. Turns out a common tactic of the movement is filing fake liens on property in what some lawyers call “paper terrorism.” Many property owners never realize there are liens on their property until they get ready to sell and then are immersed in legal procedures trying to get free of these liens. Certainly a bizarre tactic, but seems to fit like a glove with such a whack theory. Maybe this could all be dismissed as just another piece of the weirdness that is America and the variety that can find a hundred thousand people bonding in crazyville out of more than three hundred million, but then you add guns, racism, and shooting protesters to the mix and it is all deadly serious. 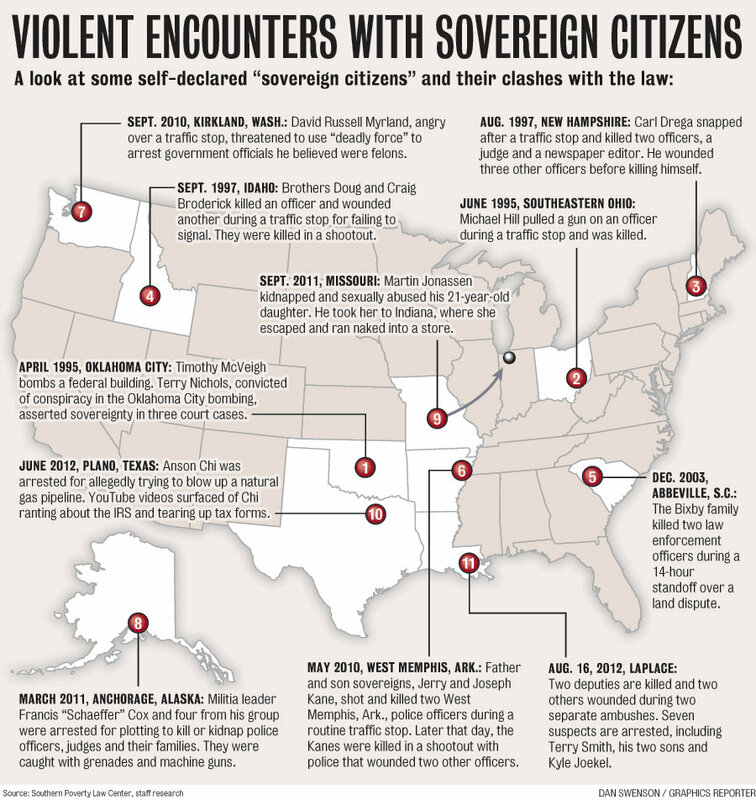 By the way one of the Oklahoma City federal building bomb conspirators was a full-on one hundred percent citizen sovereign devotee with a couple of court cases protesting payment of taxes to his credit before he help blow the big one. They should have all of our attention now. This entry was posted in Ideas and Issues and tagged Black Lives Matter, Sovereign Citizens by Wade. Bookmark the permalink. The Southern Poverty Law Center has followed and reported on these groups for I don’t know how long. What is scary is that the FBI can’t catch these guys. The FBI is only able to catch the incompetent disturbed kids with Muslim sympathies trying to blow stuff up but who don’t have the requisite bomb making skills.